For the consumer, Wotusee is an exciting, youthful new website that connects you with exclusive, ‘one-of-a kind’ (ie truly unique) accommodation experiences. 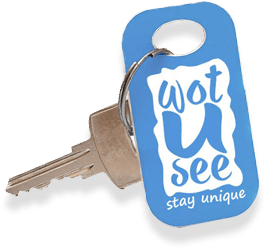 That’s where Wotusee got its name from because what you see on our site is exactly what you get – not somewhere like it as you find on most other sites! Also unlike most other accommodation websites, Wotusee puts you in direct communication with the property owner. And when you use Wotusee you are directly supporting the very people who made this industry – and your holiday experience – possible – the property owner. For the owner, with Wotusee you will no longer be at the mercy of the online booking barons. Wotusee uniquely enables you to display your once-of-a-kind allotment on multiple websites at the same time – which means your property can be booked ‘real time’ through any of these websites! When a website sells your property, all the other sites are automatically updated in ‘real time’ to say the property is no longer available. Wotusee also enables you to provide the same or different rates for your property to different suppliers, (including hot deals/specials etc). And because you’ll have your property available real time to the consumer, enquiries are dramatically reduced. Wotusee also puts you in direct communication with your customer. And because Wotusee will also help you manage more practical matters such as maintenance, cleaning and scheduling, you may find you no longer need a property manager at all! If you find a better rate for the same or comparable apartment, we will give you 10% of the purchase price back. We don't charge any bookings fees, because we're good like that. Change your mind? No problems! You won't get charged a cancellation fee or amendment fee. Exactly What You Get! You have the choice to select the exact apartment you will stay in.